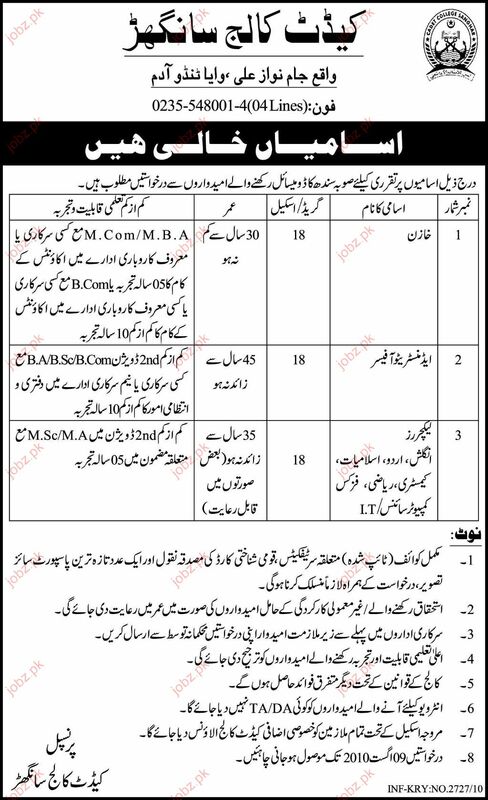 Administrator Officer and Lecturer English, Match, Islamic, Chemistry and Computer Science required in Cadet College Sanghar You can apply online at vacancy after registering at http://www.jobz.pk site. Here I am Muhammad Fahad Fayyaz Graduation from Global institute Lahore in Bs Electrical Tech Continue.I am Sub Engineer & a Electrician in Shazib & Co since March 2015 and I am willing to join Cadet College as a Sub Engineer. Here I am Ghulam Murtaza graduated from chemistry department university of sindh.I am teaching chemistry in phoenix college since january 2017 and I am willing to join Cadet College as a Chemistry lecturer. i am fresh graduate from mehran university of engineering and technology. i want to apply for lecturare in CCS. please inform me about a chemistry tutor vacancy. Dear Sir/Madam, I want job in cadet college sanghar,i have working EXPERIENCE in admin/HR DEPT.i am also x-cadet in cadet college petaro.and my father is also working in cadet college petaro last 45 years.I will be grateful to you.That i join cadet college sanghar Awaiting your reply now.